Crypto is dead, long live Crypto. We've tried to update our token offerings and blockchain financing figures to see the state of the market. 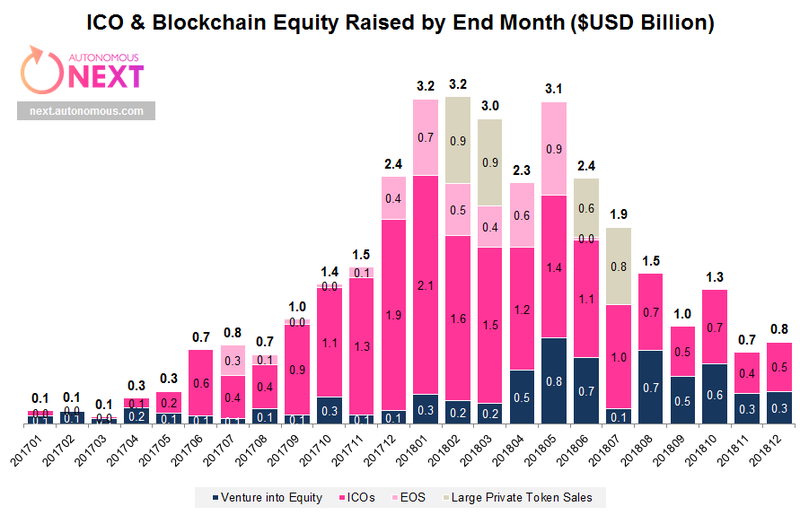 On a monthly basis in December, there continues to be an almost even split between (1) weird internet crowdfunding at $490 million, and (2) traditional venture funding into blockchain-first companies at $310 million. We think the first figure is inflated despite our attempts at scrubbing it, and reserve the right to revise. Quality of the data keeps going down, and several projects self-reported raises in December that they may have finished earlier in the year. If anything, our intuition is that real (rather than aspirationally self-reported) ICO funding is below the venture number. As an example, take the largest December self-reported ICO: Jinbi, supposedly raising $47 million for a gold/blockchain token in China. The screenshot is below, but we are pretty sceptical. On the other hand, the $180 million raise from venture into institutional exchange Bakkt is well documented and known. So let that flavor the story for you. Still, when you zoom out on an annual basis, 2018 saw $5.2 billion of venture activity and $19 billion of token offerings -- not bad for a sector in decline. Future activity is indeed trending into Security Token Offerings, with several conferences focused on the space early in the year, as well as players from across industry types competing. Whether you are an equity crowdfunding platform, an ICO developer, or a Wall Street capital markets firm, chances are that tokenizing securities and distributing them globally in a solid regulatory framework is top of mind. So will this be the saving grace of the sector? Hard to say, but it seems that tokenizing securities is about packaging (1) risky startup equity or (2) a share in some mall in Wyoming and plugging that into the equity crowdfunding theme. That may or may not result in better capital markets infrastructure, democratization and roboadvisor-led asset allocation. Or it may just be left-over junk that nobody else would buy. And second, the crypto economy needs non-financial activity to succeed. People should be building software using the global decentralized computer of Ethereum (or EOS or Dfinity) and paying for it using the global decentralized currency Bitcoin. More crowdfunding ain't that. Source: Autonomous NEXT data sets, ICO Rating, Kepler Finance, Securities.io, Inwara, among several others.